I help a lot of leaders create individual development plans using some variation of this process. This time of year (January) is always especially busy. Although every leader I work with is unique, it seems like the development goals end up being somewhat common from year to year. Improve my ability to see the big picture and take a longer range, broader business perspective. Learn to step back from the day-to-day tactical details of my business and focus on the “why”, not just the “what” and “how”. Learn to pay attention and demonstrate to others that that I value what they have to say. Use active listening, open-ended questions, body language, and eliminate distractions that get in the way of my ability to listen. Shift my leadership style away from always directing and telling and learn to guide and develop my direct reports. Work with each of my direct reports to create their own individual development plans. Learn how to understand, interpret, and use “the numbers” to improve my business. 5. Cross-functional knowledge and perspective. Learn about other aspects of the business other than my own functional silo. 6. Industry, competitive, and customer knowledge. Improve my understanding of our industry and our competitors. Get closer to our customers and find out what they need and value. Improve my ability to “command a room” and communicate in an authentic way that inspires others. Be more of a change catalyst, a champion of change. Learn to implement and sustain change in my organization. Improve my ability to manage my remote direct reports and organization. Make better use of technology to improve internal communications and collaborate virtually. Improve relationships with my peers. Be a better partner, understand their goals and needs, and learn to work together to help achieve each others goals. Improve my ability to assess, hire, promote, and develop. Fill all open positions with nothing but “A” players and replace chronic underperformers. Develop a “virtual bench” for all key positions and a succession plan for my own position. Get a handle on where I’m wasting time and shift my focus to more value-added activities. Learn ways to work more efficiently and prioritize. How about you? What’s on your leadership development plan? 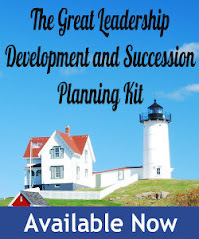 Need some help becoming a great leader or developing your organization’s leaders? Contact me to discuss leadership assessment, coaching, consulting or training. I would add a 13th point-balance. Leaders need to know how to balance their strengths and use them when needed and to reign them in when they are not appropriate. How about working on how to manage conflict and confrontation - make a list of the conversations you are avoiding and create the fierce conversations needed to address the issue/opportunity. Great post. I like number one. Oddly enough, that is the course I am taking right now in my doctoral program: strategic thinking. As a strong proponent of shared leadership and self-empowerment, #3resonates for me because in 2010 I want to move into virtual coaching to complement my writing that deals with the above two noted areas. right, I agree, strenghts over-used can easily turn into weaknesses. I agree that the ability to have that "crucial conversation" is critical. For some reason, it doesn't come up much as a common development need. It may be one of those things that leaders don't know what they don't know. Good for you - it's one of the hardest leadership skills to master. Great, I think there would be a demand for good virtual coaches. Dan, I love this post! A year or so ago, I analyzed all of the goals in the actions plans my clients had created and you have hit on two that I found rose to the top. Believe it or not, "becoming a better listener" was #1. Having a plan for developing their employees and strategic thinking/developing strategy were near the top, as was learning coaching skills and cross-functional knowledge (including networking across boundaries). I wonder if there might be some differences between what an internal coach such as yourself helps leaders to work on, and an external coach such as myself? I do occasionally have clients who work on what might be called "personal goals" such as exercising more, eating better - in addition to work goals and with the full blessing of their organizational sponsors. You? Nicely writte....how about ethical leadership? The blind pursuit of proﬁt has resulted in bribes, environmental problems, injured workers, unsafe products, closed plants, and so on—this is unethical. Many business schools emphasize the philosophical, rather than the practical aspect of ethicvs. We need a practical approach to the solution of ethical problems. I have a policy of distributing free abridged versions of my books on leadership, ethics, teamwork, motivation, women, bullying and sexual harassment, trade unions, etc., to anyone who sends a request to crespin79@hotmail.com. Good list (& Deb, I like your addition). From the items on this list, what do you find, in working with leaders, is the hardest for people to improve on? I've been working on #12 for years, and still don't feel like I have a really good handle on time management (it's a lot like counting calories, I'm good for a month, then I revert to my old ways). Hi Dan - great post! I love what you have here. I'm working on my ability to communicate with people whose styles differ from my own. Being more of an extrovert and a big picture thinker I sometimes struggle to get on the same page with more analytical and deeply process oriented individuals. Understanding and respecting the perspectives of others and learning to communicate effectively with them is my biggest challenge for 2010. Maybe you’d like to publish your list and our readers can compare? Good question - hardest things to improve are strategic thinking and leadership presence. Good for you! Have you taken a DISC or MBTI? Great idea for a post: Take specific development actions for a different competency each month of the year! I'll save the stuff that I'm already (relatively) good at for my tougher months at work. Great list Dan, many on my team have found a lot of great ideas here. I want to learn how to not be a pushover when it comes to my employees. They do not walk all over me, but they ask me for favors instead of the other managers because they know I am the most likely to say yes. What about plans to jump up several rungs on the corparate ladder? Or plans this year to finally get credit for saving the company $7-million last year and receiving no credit, oh except for the normal 3% annual raise. Are any of these goals measurable and how so?